Like I said, we’ve been experimenting with gluten free and Paleo recipes and I was determined to find a chocolate chip cookie recipe that used almond flour. I took my chances and did a Google search and just happened to come across these on Meaningful Eats, a blog that focuses on gluten free foods. The original recipe doesn’t call for coconut, but I LOVE coconut – the taste, smell – you name it, so I added some unsweetened flakes and was thrilled with how they turned out! But, if you don’t like coconut, you don’t have to use it. Instead, you could add chopped nuts or you could add both! Okay, so a few tips before you get started. To simplify things, I melt the butter and coconut oil together in the microwave for about a minute. This is especially helpful if your butter is coming straight out of the fridge. The batter seems a bit softer than “normal” cookie dough, but don’t worry, it’s fine. Also, to get the nice little round cookies, I like to use a medium-size melon baller (is that what they’re called?) or small ice cream scoop. And, because these cookies taste best the day of, I bake half a batch and then scoop the rest, freeze them on a cookie sheet and transfer them to a freezer bag. When you’re ready to bake them, just take them out and add a couple minutes to the bake time. I did this and they turned out perfect! Preheat oven to 350 degrees. Line a baking sheet with parchment paper (or I used my silpat mat). In a large bowl, cream together the butter, coconut oil and brown sugar. Add the vanilla and eggs, mixing until incorporated. Mix in the baking soda and salt. Add the almond flour, 1 cup at a time, beating well after each addition. 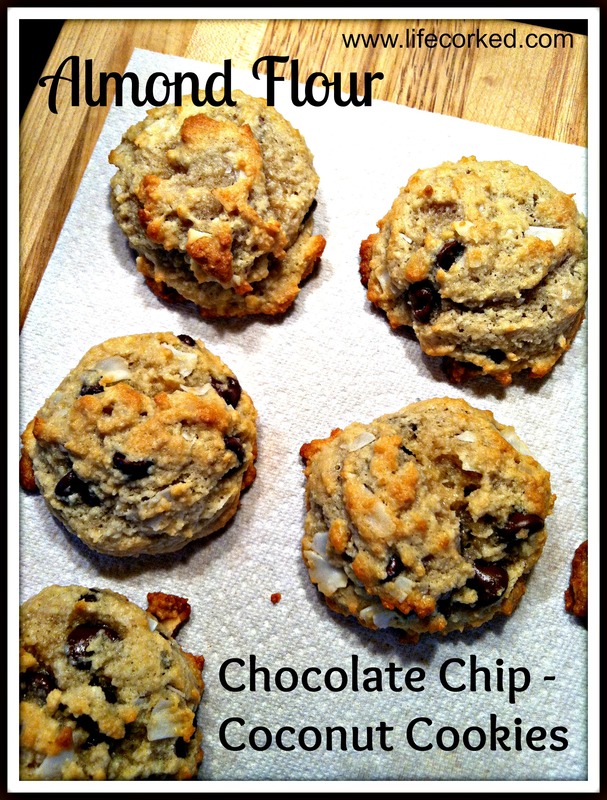 Fold in the chocolate chips and coconut and/or walnuts with a wooden spoon. Form the dough into tablespoon rounds and place on the lined baking sheet about 3 inches apart. Bake for 11-13 minutes, or until golden brown around edges. (I typically bake them for 11 minutes, but it will depend on your oven). Enjoy! And, don’t forget to stop by tomorrow for a celebration! I use almond flour a lot! Was there a special note about using it? It said see note below. I’ll definitely try these. Great tip about freezing the extra because a lot of gluten free baked items get hard quickly. Thanks for catching that! In the original recipe, it notes that you can use almond meal in place of the almond flour. However, I have never substituted, so I only listed almond flour. I made another batch yesterday and they were, again, a huge hit! They’re dangerous to have around, which is another reason why half a batch is good!